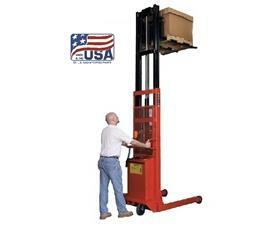 Lift to heights of 58" to 80" with hydraulic ease. Handles load up to 1000 lbs. 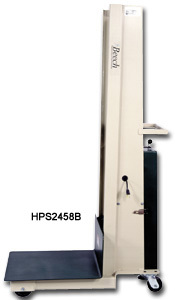 Hydraulic rams and pedal pumps are oversized and manufactured "in house" for years of trouble-free operation. Roller lift chain with over 9000 lbs. yield. Platform is welded unitized construction for strength and safety. Acrylic safety shield provides operator with unobstructed vision. 2" wide phenolic wheels and floor lock are standard. Optional wheels are available. FOB Shipping Point. 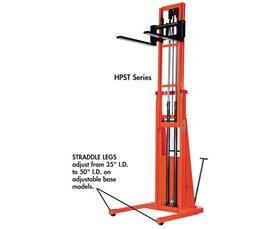 Oversized Hydraulic rams and pedal pumps lift 1000 pounds 54" to 76" on heavy duty 4" wide and 1" thick forks, roll the load on 2" wide phenolic wheels and stay in place with a standard floor lock. The operator is protected by a clear acrylic safety shield. 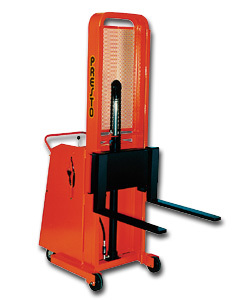 The roller lift chain has over 9000 lbs. yield. 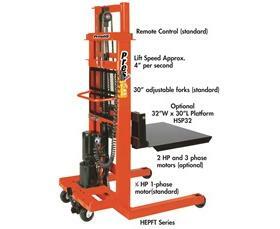 Battery powered lift models include a heavy duty deep-cycle battery and a 10 amp automatic built-in charger. Optional wheels are available. FOB Shipping Point. Unique straddle design works well with pallets and skids with or without an understructure. 12V DV power standard with on-board charger. Push buttons to raise and lower lift are located on power unit. Optional hand control on coil cord available. Key-operated ON/OFF control for better security is built into the power unit. All welded steel construction. 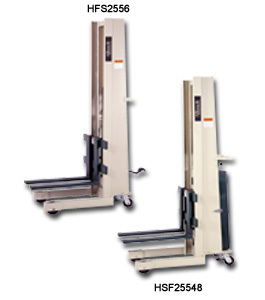 Rolls easliy on 8" phenolic casters, 2 swivel, 2 rigid. Caster lock standard. FOB Shipping Point. 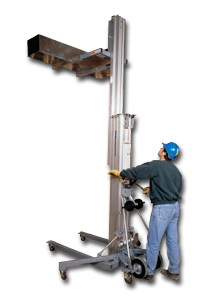 4"W. and 1" thick solid steel forks adjust from 8" to 26-1/2" OD lift to heights of 66" and 76" and lower completely to the floor. 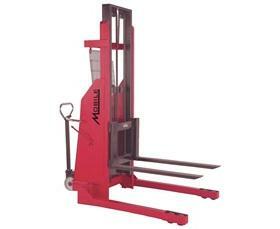 Oversized pedal pumps and hydraulic rams are manufactured in our plant for optimum trouble free operation. Yield on roller chain is 9000 pounds. Heavy duty deep-cycle battery and 10 amp automatic built-in charger are included with battery powered models. 2" W. phenolic wheels, Floor lock and Acrylic safety shield are standard. Optional wheels are available. FOB Shipping Point. 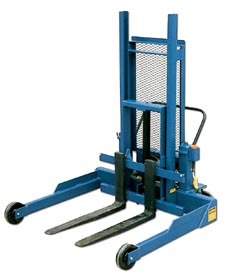 A rugged, dependable, general-purpose stacker powered by a heavy-duty 12 volt battery with a 10 amp automatic tapering battery charger. 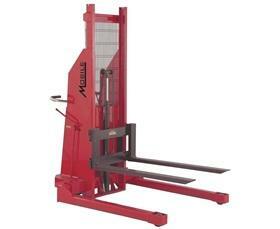 Complete with a long-wearing, heavy-duty hydraulic system. Fixed mast construction. FOB Shipping Point. Remote control floor lock and safety screen standard. With a minimally charged battery, unit can be used even while recharging. Three light LED charge status indicator included. Easy to read illuminated battery status voltometer. Order enough weight kits for your planned load. FOB Shipping Point. 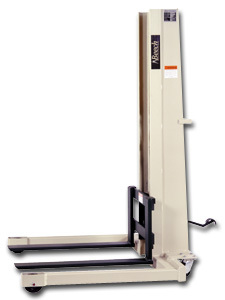 This rugged electric lift is ideal for congested and compact work areas. 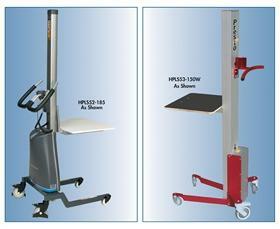 Perfect for all types of lifting or positioning work. Built to withstand the daily rigors of lifting heavy loads. Lifts 4" per second with 3/4 H.P. 1-phase motor. 30" adjustable forks are standard - optional platform sold separately. FOB Shipping Point. Rolls smoothly on 5" diameter phenolic wheels. 1000 lb. capacity at 13" load center. Not recommended for moving long distances or over uneven surfaces. FOB Shipping Point. Complete with a heavy duty hydraulic system and powered by an extra large,&nbsp;deep cycle&nbsp;12 volt battery. 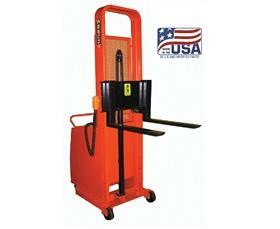 Dual 8" polyurethane fifth wheel with a spring loaded handle provides easy, pinpoint handling in congested areas. Features 5" diameter phenolic load wheels. Complete with safety screen. 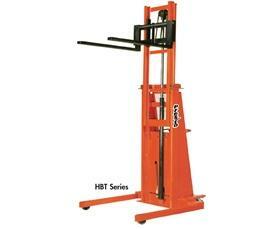 Designed for constant high-capacity performance.&nbsp;&nbsp;Requires no special training to operate. 24" load center. FOB Shipping Point.